Holy glaciers, Batman! General Comments Off on Holy glaciers, Batman! Yeah, that’s not a plastic pitcher. 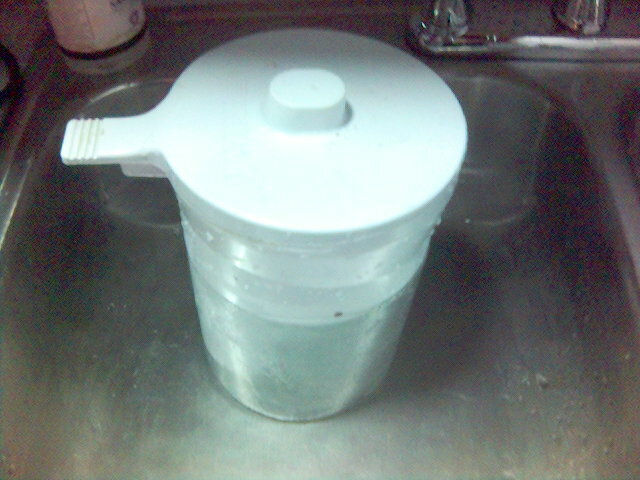 That’s the ice that I took out of the pitcher this morning. You think the fridge at work might be set a little too low? So the nice 120-GB drive that I installed a back in February has started clicking. This is a bad thing. It probably means that the drive head is snapping to one extent or the other of its travel distance. If it happens enough, the drive will permanently fail. As it is, it’s sometimes enough of an error that my laptop will stop recognizing the drive altogether, and I get the nice “no hard drive detected” logo when I reboot. Needless to say, I am not pleased with this situation. Luckily, WD has already approved my RMA, and is shipping me an advance replacement. New drive should be here in a week or so (I estimate), and I’ll buy a UPS Ground label (about 6 bucks) and ship the bad drive back to them. I’ll be doing a full random-wipe before I ship it, of course. There are two irritating parts about all of this. First (and, I think, the more time-consuming of the two), I need to do a full backup of the old drive, and restore onto the new one. Hopefully this won’t be too bad; I should be able to do it all without too much heartache. The bad part is just waiting for the stupid backup to finish; last time I tried, it ran for about 5 hours before I killed it (and came to work). I think I’ll start the new backup when I get home in this morning, and then do a “catch-up” run when the new drive arrives. Of course, the alternative is to just wait until the drive arrives, then hook it up in the USB enclosure and do the backup straight to that drive instead of using an interim device. Yeah, that’s a great idea. I’ll obviously still be doing a full backup anyway onto the other 120 that I’ve got in the enclosure right now, but I like this other idea; it’ll save me boatloads of headache. 2. When installing the new HD, I forgot to reconnect the mouse. Took laptop apart again to fix that. 5. When installing the new SuperDrive, I again forgot to reconnect the mouse cable. Grr. So this will only make the sixth time I’ve had to open it up, and this time I actually have a “black stick” (it arrived the day after the SuperDrive did). I was playing around in Second Life again this morning (I got tired of doing observations at work), and decided I needed to learn how to build stuff. A quick google search or two, and I ended up at the Ivory Tower Library of Primitives. I’m still working through the lessons (I’m on the 4th floor, and just finished with cubes, moving on to cylinders), but it’s very well laid out, and the notecards make sense to me. I think I’ll play around with this stuff some more, and build a few things in one of the sandbox regions. And if it’s fun enough, I’ll get a “real” account (i.e., I’ll start paying the Lindens for land ownership rights) and build a small workshop or something. If you haven’t heard of Second Life, check out its Wikipedia entry. Just realize that it’s a lot more fun than the Wikipedia article makes it seem. It’s not really a game per se, more like a 3-D MOO. I was at work this morning reading a book, and one of my co-workers started this conversation with me. It moved to speech beyond what’s quoted here, but what’s said here is really a good starting point for discussion about society in general, and about stereotypes (and the apparent reason behind them). This conversation also made me realize that I really miss having long, drawn-out discussions with people on higher subjects; I think that working tech support for as long as I have has made me dumber. Or at least deadened my previous ability to have lofty conversations without having to slow down the way I think. Â» says a lot about the mindset of Indians (i.e, persons from the [Indian] subcontinent), especially in light of how they’re utilized in the modern business world. Never heard of it, but I dont watch soaps either. So far tech support being moved doesn’t really bother me, everyone needs to make money to eat, I’m peaceful and all-loving. What annoys me are the hick assholes that call in and say “oh thank god you live in america”. Thats when the subject of foreign tech support really gets to me. True. And I think I agree with the generalization of the “35=10” thing; by and large, the americans that call tech support (not the ones that need to, just the ones who do) are stupid. And I’m not speaking of mere ignorance, either; ignorance is easy to get beyond because it’s merely a lack of knowledge. Stupidity (at least, one definition of it in my mind) is being ignorant, knowing you’re ignorant, and deciding that you like it that way. So it’s difficult to understand the accent; most of the time, if you listen carefully (instead of just waiting for your turn to speak), it’s not that difficult to understand what you’re hearing. I think part of it is just people thinking that because someone sounds different in their speaking manner, they’re considered less intelligent. Good point, ppl assume if you don’t speak english you aren’t smart. Â» I’ve heard techs here that have accents mention little things like that as well. Real shame. It really is, especially when you consider how many “foreigners” are also considered some of the “smartest” people in the world: Greeks and Romans abound in philosophy and math (Plato, Aristotle, Socrates, Pythagoras, etc). psychology by and large was perfected by Austrians and Germans (Freud, Jung). The Chinese invented so many things so far in advance of the “Western World” that it’s ridiculous. Heck, even Calculus was invented (simultaneously, some say) by an Englishman and a German (Newton and Leibnitz). And none of them spoke “American” English without an accent (or even spoke English at all). You’ve thought a lot about this, havent you? Heather and I went to the botanical gardens out at Zilker park this past weekend, and I dusted off my old Minolta Maxxum 430si (yes, it’s really a “dead media” camera – 35mm film). The photos turned out pretty good, and aside from the heat it was a really nice time. I think I might have to upgrade to a digital SLR though; Wolf Camera has a pretty nice Konica Minolta digital body for just under $600. Advantage to that particular body: my old lens will work because Minolta hasn’t changed their ring size. And based on the press release on their web site, they probably never will, either.